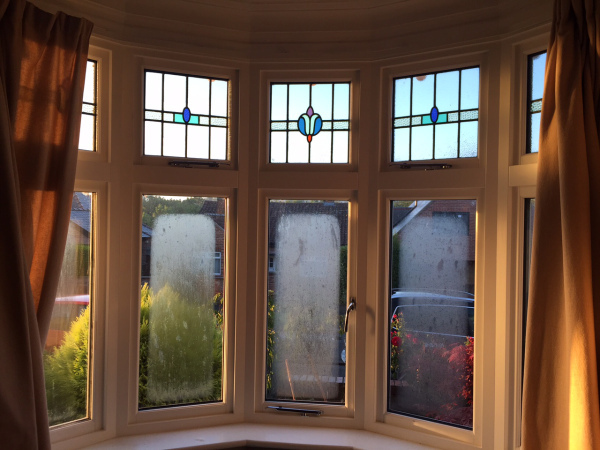 As we move again towards the colder shorter days, and low light of Autumn we’re reminded of the seasonal glass issues that this time of year can bring for installers. Last Autumn we published some guidelines on external condensation, we hope you found this useful and its posted again here as a reminder. This year I’d briefly like to look at the effect of the morning and evening sun, its temporary effect on the visuals of installed glass and thus the importance of glass manufacturer, installer and customer all operating to the same standardised inspection criteria. This really struck me whilst driving home in bright Autumn sun, through a tree lined street last week. I became suddenly aware that the sky was teaming with thousands, millions of particles – it literally looked like the attack of the midgies. Tiny flies, grains of dust, and pollen were shining like millions of little lights in front of me and for a second it was a bit alarming, as if an insects nest had been disturbed and they were swarming all over. Suddenly the sun went behind a tree and it all disappeared, instantly. When the bright and direct light disappeared, so did the flies. Or actually they didn’t – it just dawned on me that they are always there, it’s just only under extreme lighting conditions could they be seen so vividly. This incident brought to mind the problems that can be associated with glass units, when viewed in extreme light. It’s the time of year where we are getting a few instances each week where we are being asked for replacements due to marks in cavity, from installations many months previous. The home owner was assumedly happy with their glass and windows for several months, but on certain days, at certain times of year and from certain angles small marks, streaks or other visual effects are apparent. Just a reminder therefore to encourage all staff and customers to be aware of and to follow these instructions when considering whether a unit should be replaced not. We often offer site visits but are told only to come at certain times of the day when the sun is round – this should always ring alarm bells. If these instructions are not followed properly, then almost certainly both installer and IGU supplier are going to spend time and money which could be avoided with the right understanding of inspection criteria. © Copyright Clayton Glass Ltd, Harelaw Industrial Estate, North Road, Stanley, Durham, DH9 8UX.